This new designed alternating pressure overlay offers the best alternating pressure therapy in its class. This adjustable overlay is perfect to prevent and treat pressure ulcers and works with the patients existing bed. This alternating pressure overlay uses 17 individual bladders that alternate to reduce pressure, stimulate blood flow, and heal up to stage 2 pressure ulcers. This 5"depth overlay offers both alternating pressure and low air loss therapy. 16 laser holes incorporated into the cells are designed to keep the patient cool and dry The ultra quiet pump offers a 10 minute cycle time for pressure relief, healing and pain management. The adjustable air flow settings allow the patient to increase the firmness and softness of the mattress for maximum comfort. The cover is low shear to protect the skin and is waterproof, removable, and easily washable. Ships in 48 hours! This new designed alternating pressure overlay offers the best alternating pressure therapy in its class. 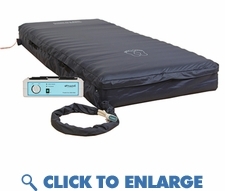 This adjustable overlay is perfect to prevent and treat pressure ulcers and works with the patients existing bed. This alternating pressure overlay uses 17 individual bladders that alternate to reduce pressure, stimulate blood flow, and heal up to stage 2 pressure ulcers. This 5"depth overlay offers both alternating pressure and low air loss therapy. 16 laser holes incorporated into the cells are designed to keep the patient cool and dry The ultra quiet pump offers a 10 minute cycle time for pressure relief, healing and pain management. The adjustable air flow settings allow the patient to increase the firmness and softness of the mattress for maximum comfort. The cover is low shear to protect the skin and is waterproof, removable, and easily washable. � Removable water resistant, non-shear, anti-microbial nylon cover, non-skid bottom cover prevents slipping. � Alternating cell depth: 5"
� Low air loss and alternating pressure therapies in one system. � Air flow dial to obtain custom patient comfort and pressure levels. � Hospital grade UL approved power cord.